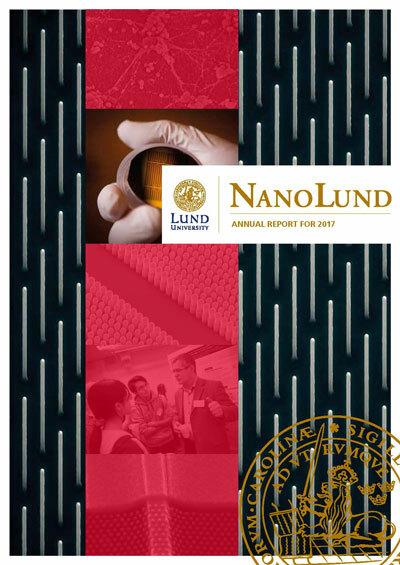 I am very glad to present NanoLund’s Annual Report for the year 2017 - a document that every member of our community can feel proud of. In addition to the pioneering research excellence we strive for, it also reflects our many other and equally important activities, including: developing, building and running infrastructure that is open to users inside and outside of the university; professional administration and support; strong engagement in undergraduate and graduate education; a wide range of outreach activities to which many of our members enthusiastically contribute; being an open environment that welcomes collaborations, new members, and actively shares expertise; and leadership in bringing nanotechnology to the market. I sometimes wonder how it is possible that we get all of these things done, and the answer is of course the hard work by our technical and administrative staff, teachers and scientists and the support by our collaborators, funders, university and regional leaders, and industry representatives. NanoLund is a team effort that requires all of your contributions – thank you! With summer approaching it is time to take a well-deserved break, think about something entirely different (or nothing at all), and re-charge our batteries. 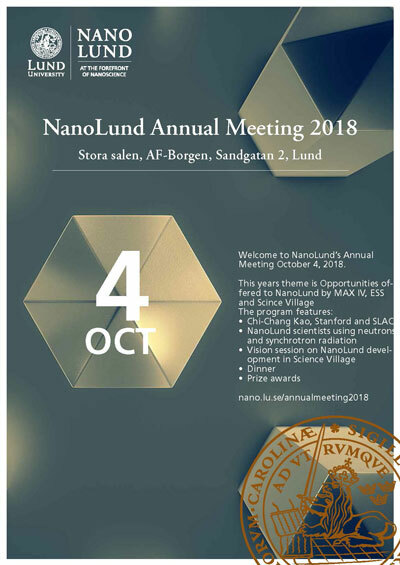 The Annual Meeting is NanoLund’s main event where we invite everyone in our environment to celebrate progress made during the year and to discuss ongoing projects and form new collaborations. Some of its most important features are the poster sessions where we encourage all projects in NanoLund to be presented. This year, the oral presentations, both from NanoLund scientists and from external speakers, will focus on Opportunities offered to NanoLund by MAX IV, ESS and Science Village. Talks will include a keynote by our new Scientific Advisory Board member Chi-Chang Kao from Stanford and SLAC, several invited talks by NanoLund scientists on a wide range of projects that use neutrons and synchrotron radiation – from nanowire materials science to device physics and nanobiology -, as well as an exciting session where experienced scientists with a range of backgrounds will share their visions for how NanoLund might develop in Science Village. And of course we will end with a dinner with prize awards. Don’t miss it! To our meeting we welcome all members and friends of NanoLund. The NanoLund Excellence Support Award is awarded to emphasize the critical importance of the work done by NanoLund administrative and technical personnel, without which none of our research and teaching would be possible. We therefore wish to highlight and reward some of the great achievements and excellent work in this area. We strongly encourage nominations from everyone in NanoLund, from PhD-students to TA personnel to professors. With a few short lines you can give positive and highly appreciated feedback to an employee you think deserves recognition for her/his achievements and excellent support. To nominate, please send a simple email to anneli.lofgren@ftf.lth.se and include the name of the employee and a short motivation describing in which way they contribute to extraordinary support and deserve the prize (a few lines are enough, maximum one page). The winners will be announced at the NanoLund annual meeting on October 4th. Your nominations make a difference! We welcome our new Board members and thank you for your willingness to help in this important role. NanoLund strongly encourages international exchange, and offers financial support to both PhD students and senior scientists for visits with international academic and industry groups in working in nanoscience and nanotechnology. Recent incoming visits supported by NanoLund include a visit from Aerodyne Research to support aerosol mass spectrometer development in the group of Joakim Pagels (Dec 2017), and support to Åsa Haglund from Chalmers who spends Mondays and Tuesdays in Lund during 2018. For outgoing visits, NanoLund has supported Fredrik Brange at Mathematical Physics for a research visit at Aalto University during Nov 2017-Jan 2018. The purpose of the visit was to combine research on waiting time distributions in the Flindt group with Fredrik Branges own research on energy and temperature fluctuations . Also Anders Malmendal at Biochemistry and Structural Biology received support for his research visit for microfluidics device development at Prof. Tuomas Knowles’ laboratory at University of Cambridge and NMR work at Prof. John Christodoulou’s laboratory at University College London during May-August 2018. To find more information about the NanoLund support for incoming and outgoing research visits read here. 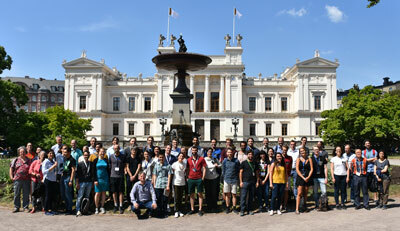 NanoLund hosted a workshop for fluorescent labelling within super resolution microscopy, Superresolution Techniques 2018 during May 27-29. The workshop kicked of on Sunday with a pre-workshop tutorial about superresolution optical microscopy with 36 participants. The following two days were filled with talks by Swedish and European speakers and a total of 85 participants were present. A Marcus Wallenberg symposium on Tailored surfaces in operando conditions was held in Ystad June 11-14. A number of international speakers from universities and industry discussed recent advances in operando investigation of reactivity at surfaces from both experimental and theoretical approaches. The symposium also included visits to ESS and MAX IV and the TEM facility at Lund University. Swedish Radio has made a feature on nanosafety - Hur farlig är nanotekniken? (in Swedish, 19 min) - involving NanoLund scientists Christina Isaxon, Knut Deppert, Maria Hedmer and Tommy Cedervall. A short version was also broadcasted by the Science news program Vetandets värld: Säkerhetsforskningen kring nanomaterial går långsamt (in Swedish, 2:07 min). 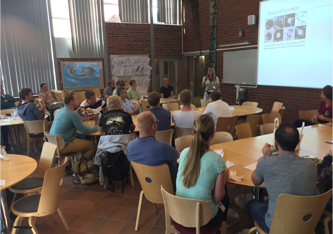 On May 22, NanoLund hosted an event for matching master thesis students with supervisors with nano-related Masters projects. After short overviews of the different research areas within NanoLund, students had the opportunity to meet researchers in the areas they found most exciting and discuss possible Masters projects. The Bio4Comp inspired artwork SMART>SOS sound-automaton was presented to the public for the first time on 15th June at IRCAM/Centre Pompidou in Paris. The artwork is a result of a collaboration between the Bio4Comp project, coordinated by NanoLund, and the artist Tim Otto Roth. In biocomputation, protein fibers move in a network of nanometer-sized channels. The network is designed to reflect a mathematical algorithm. Each path the fibers take through the network is a correct solution to the algorithm. 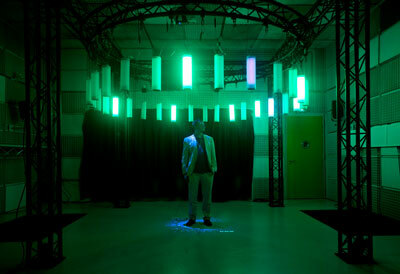 In the SMART > SOS project, the artist has translated the activities of the biocomputing fibers into sound. Depending on the pitch of the sound, the loudspeakers change color. Thus, in this hanging ring of loudspeakers, the audience can experience a new dimension of biocomputation. 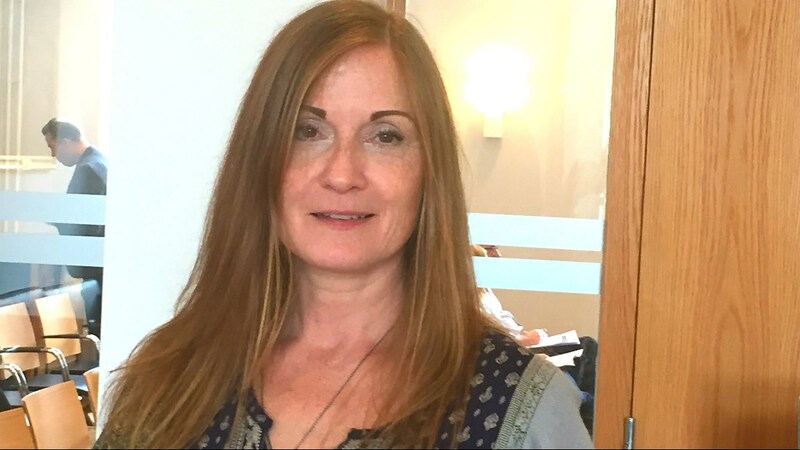 Anne L'Huillier has been elected as a member of the National Academy of Sciences of the USA. Members are elected to the NAS in recognition of their distinguished and continuing achievements in original research. Membership is a widely accepted mark of excellence in science and is considered one of the highest honors that a scientist can receive. Read more about NAS here. NanoLund scientist Martin Hjort is one of the 2017 Cozzarelli Prize Recipients in the category Engineering and Applied Sciences. The annual award acknowledges papers that reflect scientific excellence and originality. It is given annually to six papers published in the leading scientific journal PNAS. NanoLund alumni Pyry Kivisaari has won the highly prestigious Academy Postdoc funding from the Academy of Finland. Pyry was at NanoLund during 2014-2017 as a postdoc, working on modelling of nanowire LEDs and solar cells, and was funded by the Nokia Foundation. As a research center within Lund University, part of our job is to inform others of our activities. We hope that you find this newsletter of interest and would like to receive it in the future. If not, simply click Unsubscribe at the bottom of this page. We consider your email address personal data and we will use it solely for the purpose of informing about NanoLund activities and we do not pass it on to third parties. If you wish to read about the Lund University policy for personal data it is available here (in Swedish - an English version was not yet available at the time of the deadline for this newsletter). NanoLund has a twitter account. Bi, Z. X. et al. Self-assembled InN quantum dots on side facets of GaN nanowires. Journal of Applied Physics 123, doi:10.1063/1.5022756 (2018). Chen, I. J., Burke, A., Svilans, A., Linke, H. & Thelander, C. Thermoelectric Power Factor Limit of a 1D Nanowire. Physical Review Letters 120, doi:10.1103/PhysRevLett.120.177703 (2018). Hell, M., Flensberg, K. & Leijnse, M. Distinguishing Majorana bound states from localized Andreev bound states by interferometry. Physical Review B 97, doi:10.1103/PhysRevB.97.161401 (2018). Li, Z., Persson, H., Adolfsson, K., Oredsson, S. & Prinz, C. N. Morphology of living cells cultured on nanowire arrays with varying nanowire densities and diameters. Science China-Life Sciences 61, 427-435, doi:10.1007/s11427-017-9264-2 (2018). Ren, D. D. et al. Single-Mode Near-Infrared Lasing in a GaAsSb-Based Nanowire Superlattice at Room Temperature. Nano Letters 18, 2304-2310, doi:10.1021/acs.nanolett.7b05015 (2018). Timm, R. et al. Self-cleaning and surface chemical reactions during hafnium dioxide atomic layer deposition on indium arsenide. Nature Communications 9, doi:10.1038/s41467-018-03855-z (2018). Graczyk, M. et al. Nanoimprint stamps with ultra-high resolution: Optimal fabrication techniques. Microelectronic Engineering 190, 73-78, doi:10.1016/j.mee.2018.01.008 (2018). Metaferia, W. et al. n-type doping and morphology of GaAs nanowires in Aerotaxy. Nanotechnology 29, doi:10.1088/1361-6528/aabec0 (2018). Zhang, F. Y. et al. Formamidinium Lead Bromide (FAPbBr(3)) Perovskite Microcrystals for Sensitive and Fast Photodetectors. Nano-Micro Letters 10, doi:10.1007/s40820-018-0196-2 (2018). Leshchenko, E. D., Kuyanov, P., LaPierre, R. R. & Dubrovskii, V. G. Tuning the morphology of self-assisted GaP nanowires. Nanotechnology 29, doi:10.1088/1361-6528/aab47b (2018). Zeng, X. L. et al. Electrical and optical evaluation of n-type doping in InxGa(1-x)P nanowires. Nanotechnology 29, doi:10.1088/1361-6528/aabaa5 (2018). Borgstrom, M. T. et al. Towards Nanowire Tandem Junction Solar Cells on Silicon. Ieee Journal of Photovoltaics 8, 733-740, doi:10.1109/jphotov.2018.2816264 (2018). Otnes, G. et al. Understanding InP Nanowire Array Solar Cell Performance by Nanoprobe-Enabled Single Nanowire Measurements. Nano Letters 18, 3038-3046, doi:10.1021/acs.nanolett.8b00494 (2018). Yang, B. et al. Lead-Free Silver-Bismuth Halide Double Perovskite Nanocrystals. Angewandte Chemie-International Edition 57, 5359-5363, doi:10.1002/anie.201800660 (2018). Zeng, X. L., Otnes, G., Heurlin, M., Mouro, R. T. & Borgstrom, M. T. InP/GaInP nanowire tunnel diodes. Nano Research 11, 2523-2531, doi:10.1007/s12274-017-1877-8 (2018). Do you have a story, a discovery or an event we should include in our newsletter? Please use the Contact link below.